Stampede is just around the corner and that means one thing: pancakes. Whether you like them loaded with bacon and syrup or gluten-free and vegan, this city's got a Stampede breakfast for every kind of cowboy and cowgirl. Stampede is just around the corner and that means one thing: pancakes. Whether you like them loaded with bacon and syrup or gluten-free and vegan, this city's got a Stampede breakfast for every kind of cowboy and cowgirl. From the tried-and-true to the new and novel, here are our top picks for a flapjack-flippin' good time. There are some who look at food as art, and others who make art out of food. If you're in the latter camp, Raw Canvas has the pancake breakfast for you. Guests are invited to come with a design or image and the artists at the Kensington art studio will serve it to you in food form. Now that is getting creative in the kitchen. Friday, July 6, from 7:30 a.m. until 12 p.m at Raw Canvas, 1130 Kensington Road N.W. 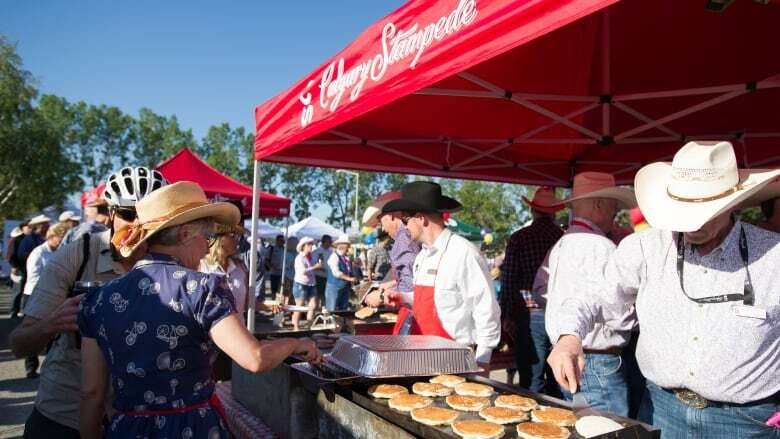 For a dose of good old-fashioned cowboy culture, the Stampede Chuckwagon Breakfast is serving up square dancing, Indigenous dance and, best of all, sizzling hot flapjacks and bacon off of the back of genuine GMC Rangeland Derby chuckwagon. July 7, 9 and 10 through 14, from 8:15 a.m. until 10:30 a.m. at Fluor Rope Square. For an animal-free pancake breakfast, CalgaryVegan is back for its second year of hosting a plant-based Stampede soiree. This free event offers meat-free alternatives including vegan pancakes, veggie sausages, potatoes and a fundraiser bake sale with proceeds going to animal rescue charities. Saturday, July 7, 9 a.m. until 12 p.m. at the Bridgeland Riverside Community Association, 917 Centre Avenue N.E. Life without pancakes is a sad, sad existence. 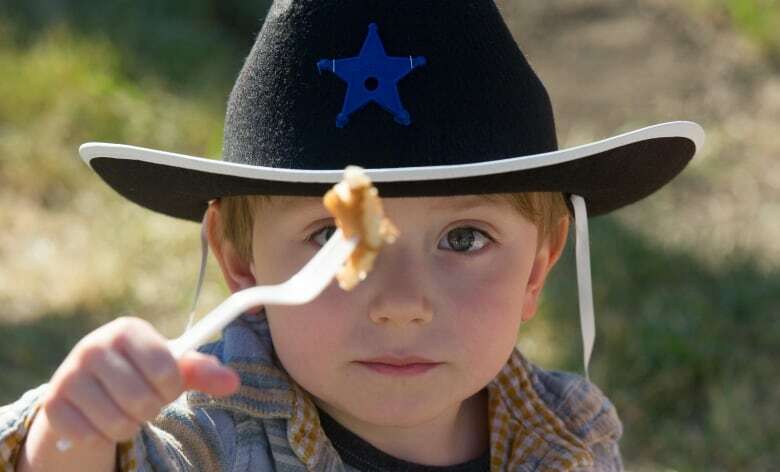 Thankfully there's a Stampede Breakfast for those with celiac disease or gluten sensitivities. Wendy T's annual event is billed as the city's original and longest running gluten-free Stampede breakfast. Find this wheat-free oasis on July 7 from 9 a.m. to 11 a.m. at the Marda Loop Community Centre, 3130 16th Street S.W. For an Asian twist on your classic Stampede breakfast, the Agahan Filipino Stampede Breakfast has cultural and food fusion on offer. The fun takes place Sunday, July 8, from 7:15 am. to 10 a.m. in the Pacific Hut parking lot at 3223 17th Avenue S.E. What better way to soothe the sting of serving up parking tickets to unsuspecting Calgarians than with pancakes? For one day only, the Calgary Parking Authority will be doling out stacks of something people actually want with its Stampede Breakfast, celebrating the Parking Authority's 50 years of keeping us all on our toes and out of pocket. You can even enter to win $100 of free parking. The amnesty takes place on Tuesday, July 10, from 7 a.m. to 9 a.m. at 620 9th Avenue S.W. If downtown isn't your jam, the Stampede Caravan volunteers are bringing the best of the city's pancake breakfasts to your local mall. All week, from July 7 to July 14, they'll be livening up the city's suburban shopping centres with family entertainment, music and of course, flapjacks. Ismaili Muslim Stampede Breakfaston Saturday, July 7, 7:45 a.m.-11 a.m. at the Ismaili Muslim Jamatkhana and Centre at 1128 45 Ave. N.E. Check out this year's parade float, a hearty breakfast, line dancing, a special art exhibition called "Expressions of Diversity" and a mini-midway for the kids. Calgary MFRC Stampede Breakfast on Tuesday, July 10, 8 a.m.-11 a.m. at the Calgary Military Family Resource Centre, 4225 Crowchild Trail S.W. Open to all current and retired Canadian Armed Forces community members and their families. Best of the East Stampede Breakfaston Thursday, July 12, 8:30 a.m.-11 a.m. on 17 Avenue S.E. between 31 Street S.E. and 33 Street S.E. You won't find food like this at any other Stampede Breakfast. Representing cuisine from around the world, Calgary restaurants serve up breakfast finger foods from Indonesia, Ethiopia, the Middle East, Thailand and the Caribbean. And of course, the obligatory Stampede pancakes. And of course you can find us every day at the CBC broadcast booth on the Stampede grounds — we will be there for all 10 days of the Stampede. In addition,The Calgary Eyeopener and The Homestretch will broadcast live from the broadcast booth on Wednesday, July 11, from 6 a.m.-8:30 a.m. and 3 p.m.-6 p.m. Come watch live radio get made, meet Ceebee and walk away with some cool CBC Calgary swag! We'll also be at the Stampede Parade on Friday, July 6. If you can't make it down to the parade, be sure to tune in to CBC Calgary's Facebook page, CBC Calgary's website or CBC Television to watch a livestream of the Stampede Parade hosted by our very own Doug Dirks and Angela Knight. CBC Sports is the home of the Calgary Stampede. Watch all the action — including the Parade, Rodeo and Rangeland Derby — beginning on Friday, July 6, here. Check out the broadcast schedule for CBC's full coverage of the Calgary Stampede. You'll be able to find all the latest news, results and information from the Stampede on the CBC Sports Calgary Stampede page. Got a favourite Stampede breakfast tradition? Tell us in the comments section below. Likewise, if you're hosting a Stampede breakfast, feel free to add the details in the comments section below. ​Read more articles by CBC Calgary, like us on Facebook for updates and subscribe to our CBC Calgary newsletter for the day's news at a glance.